RegalPoker .com Blackjack is played with eight fifty-two card decks. After each game has been played, the used cards are shuffled back into the deck. All face cards are valued at ten and the cards from 2-10 are valued as indicated. Aces can be valued at either one or eleven; if counting the Ace as eleven would put the hand over twenty-one, the Ace is automatically counted as one instead. You do not need to specify which value the Ace has as it’s always assumed to have the value that makes the best hand. The value of a hand is the sum of the values of the individual cards. For example, a hand containing a Jack, 3, and 4 has a value of 17. Your chips are stacked by denomination ($0.01, $0.10, $0.25, $1, $5) at the bottom of the screen below your Sign In Name. Select the amount you would like to wager on a given hand by clicking the left mouse button on the chip of that denomination. The amount wagered per hand may be increased or decreased by placing the mouse on the stack that you wish to add or subtract to your bet. Each time you click the left mouse button you will add a chip from that pile to your planned wager amount. Likewise by clicking on the right mouse button you can decrease your planned wager amount. If you place a wager that is lower than the minimum table bet limit, your bet amount will be automatically adjusted to the minimum bet amount. Requests another card. You can request a hit as many times as you like, but if your total goes over twenty-one, you will “bust” and lose the hand. If you have two cards of the same denomination, a Split button will appear. You can split your cards into two hands and play each hand separately. Your original bet will be duplicated for the new hand. Each hand will be played out as usual except when splitting Aces, where only one additional card per hand is dealt. A white box displaying your card total will appear over each hand indicating which hand is active. The split option can only be used once per hand — you cannot split part of a split hand. Any winning 21 obtained after splitting a pair is paid 1-to-1. If you select this option, three things will happen: you will get exactly one more card, your turn will end, and your bet will be doubled. Whenever the dealer’s up card is an Ace, the player has an option of taking insurance. The player may opt to take insurance by clicking on the “Insurance” button. If you do not wish to take insurance, you simply click on the “Pass” button to proceed with the rest of the hand. If the player believes that the dealer’s down card is a 10 ranking card, then the player is permitted to place a side bet of half the original wager as insurance. If the dealer does have a 10 ranking card, the player is immediately paid 2-to-1 on the insurance bet, but the original wager is lost unless the player too has a blackjack and pushes with the dealer. Here the player is simply betting that the dealer’s unseen card is a 10 valued card. The Double Down and Split options will only be active immediately after you receive your first two cards. 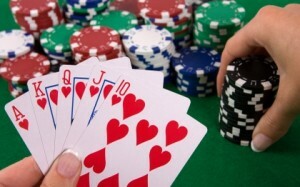 If the dealer has an Ace showing, you will be offered a chance to buy Insurance for half of the amount you bet. When you buy insurance you are, in effect, making a second bet. You are betting that the dealer has a natural blackjack. If the dealer does have a natural blackjack (in other words, his down card is a ten or a face card), you will collect a payoff of 2 to 1 on your insurance. You will also lose your original wager, unless you have a natural blackjack too. If the dealer does not have a natural twenty-one, the rest of the hand is played out as usual and you will lose your insurance money. If you win the hand, you will get back your original bet plus the same amount in profit. 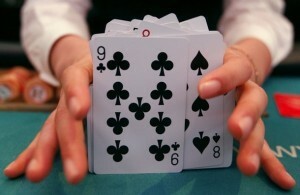 A hand that consists of an Ace and any ten value card is called a natural twenty-one, or a natural blackjack (except in the case of a Split hand – see details above). If you win with a natural blackjack, you will be paid off at three-to-two odds, which means you get your original bet back plus 150% profit. (So if you bet $50 and win with a natural twenty-one, you get $50 (your bet) plus $75 (your bet plus half of your bet), which totals to $125. 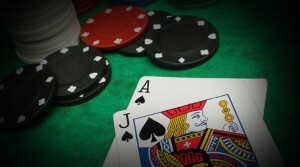 Basic blackjack strategy is defined as the proper play of cards knowing only your hand and the dealer’s exposed card. It does not involve card counting (an advantage lost in playing RegalPoker .com with 8 decks reshuffled after each hand) or remembering which cards were played previously. The basic blackjack strategy is created through intensive computer simulations that perform a complete combinatorial analysis. 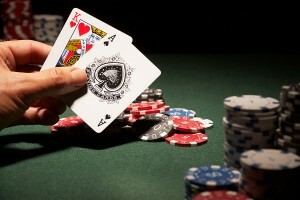 In this method, the computer “plays” tens of thousands of hands for each Blackjack situation possible and statistically decides which decision best favors the player. Basic strategy is usually printed as tables with the dealer’s up card the first row and your two card combination the first column. The other entries in the table tell you what to do (Stand, Hit, Double-Down, Split) with the different combinations of dealer and player’s hands. Basic blackjack strategy tables for RegalPoker .com rules (8 decks, dealer stands on 17, double-down on any two cards, double after split allowed, no re-splitting of cards allowed, no surrender) are shown below for hard totals, soft totals, and pairs along with a legend.